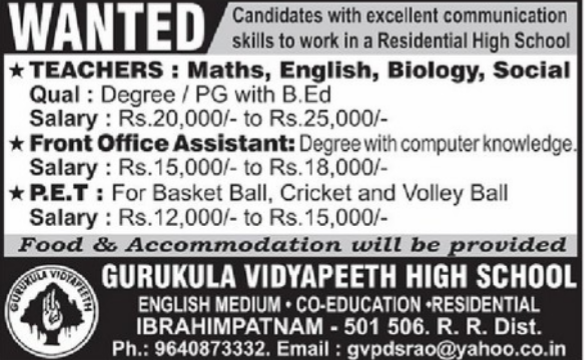 Gurukula Vidyapeeth High School, Ibrahimpatnam has advertised in EENADU newspaper for recruitment of Teaching/Non Teaching Faculty jobs vacancies. Interested and eligible job aspirants are requested to apply immediately. Check out further more details below. 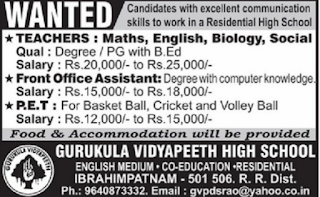 Name of the School: Gurukula Vidyapeeth High School, Ibrahimpatnam. Special facilities are provided for girl students. There is a separate and secure hostel to accommodate 85 students who are taken care of by strict and affectionate lady wardens. There are indoor and outdoor games facilities separately for girls. Training in music, arts and dance is given by instructors trained in the respective fields. We claim to have one of the best hostels for girls in the country. (c)P.E.T: for Basketball, Volleyball and Cricket.